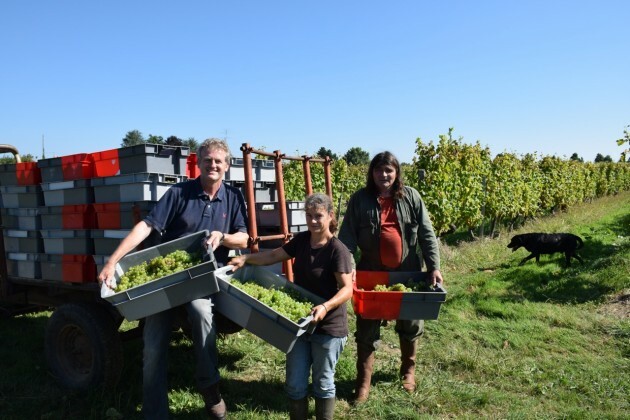 We kicked off the 2014 harvest at Bauduc last week by picking some white grapes by hand. These were from young Sémillon vines that we planted exactly ten years ago. The most effective way to harvest white bunches by hand is to cut and sort them into small, stackable crates called cagettes. I say ’sort’ although what we really mean by this is to cut out any ugly, mouldy bits. This process is used by many of the leading Bordeaux chateaux nowadays for their reds, with many having switched to using cagettes in the last few years. The advantage with stackable crates is that the bunches don’t get crushed, so the grapes stay intact and the juice doesn’t oxidise. You don’t want a soupy trailer full of grapes and juice warming up under a midday sun. And since the beginning of September it has been sunny and, mostly, pretty hot. With the brilliant Nelly and Daniel ‘Ramone’. 2014 is our 16th harvest together. We have a small team of around 16 pickers and four porters, in addition to Daniel, Nelly and me. For the mornings only mind, as the afternoons are too hot to harvest – not for the team, but for the grapes. Freshness is the key.